A Chinese made copy of the Marbles version of a Germanic saufanger. Known by various names from around the world and made in Europe, the U.S., the Indian Subcontinent and now China, this class of knives folds its blade into the handle, but significant portions of the blade extend beyond it. Most commonly these are lock-back blades and frequently have a collapsible guard. This design allows a long blade to be carried in a shorter-length knife which is ideal for foot hunters who may be pursuing wild boars and hence the German name of Saufangers or Boar Stabbers. Sheffield folding blade hunter with long thin blade. It is dangerous for a writer to attribute a knife design to a particular person, but Paul L. Holmer in the April, 2002, issue of Knife World makes a reasonable case that this knife, if not invented by, was certainly popularized by Admiral Charles Henri Theodat D’Estaing du Saillans (1729-1794) (And you thought you had problems picking out a name for your child.). As a Vice Admiral of the French navy he fought the British navy during the American Revolutionary War and was wounded in an assault on the British- occupied city of Savannah, Georgia. He is attributed with designing, or at least popularizing, these knives as compact utility and fighting knives that could be used by sailors as working knives when folded or, when opened, as dirks in a fight. Button-operated English design with sheath. game. When killing a red deer or boar with a knife, the blade has to have sufficient length to reach the heart of the animal when driven in from behind the shoulder. When not in use, their shorter lengths made them less cumbersome to carry when chasing game with dogs on foot through the rough, tangled country where animals like to live. Well marked Sheffield knife with typical features. Operating and locking mechanisms were only limited by the ingenuity of man, which was considerable in this case. These included buttons (common on English knives), levers (often used on those from Central Europe) or less commonly ring locks, pushing down on a secondary blade in the handle or the “pump lock” which is commonly used today with a cut out in the back of the knife where a downward push on the spring unlocks the blade, according to Holmer. These knives often have two locks. One lock secures the blade when it is closed and another to locks it open. Examples that I have seen mostly English with the push-button locks or Germanic with a lever lock, such as shown on the Chinese made copy of a Marble knife shown with a watermelon in the lead photo. This is a handsome knife that is handled in stag and is patterned after Marble’s version of the Germanic Saufanger. These never “caught on” in the U.S., although most cutlers made something like this during their history. One interesting derivation was produced by Case. Case's version is a useful knife even when closed. When opened it becomes a double-edged dagger. The fact that these are somewhat uncommon, interesting looking and have a diversity of designs make these knives highly collectible. I am not a collector, but am more interested in the utility of this design, rather than the appearance or supposed value. When I had a chance to purchase a new, well made, example of this type of knife from Smoky Knife Works, I grabbed it. There are much cruder examples available from Pakistan, but this Chinese-made example is far superior to those, and better that many of the high-priced, beat up, examples that I found at the 2011 Atlanta Blade Show. Because these knives have blades that extend beyond the handle they require sheaths. Typically the European sheath has a thin leather belt strap which is often missing in older knives. I prefer the thicker, more robust sheath provided with the Marble knife which is larger and secured by both stitching and rivets. As I received the knife in mid-Summer, I had no game to kill with it. 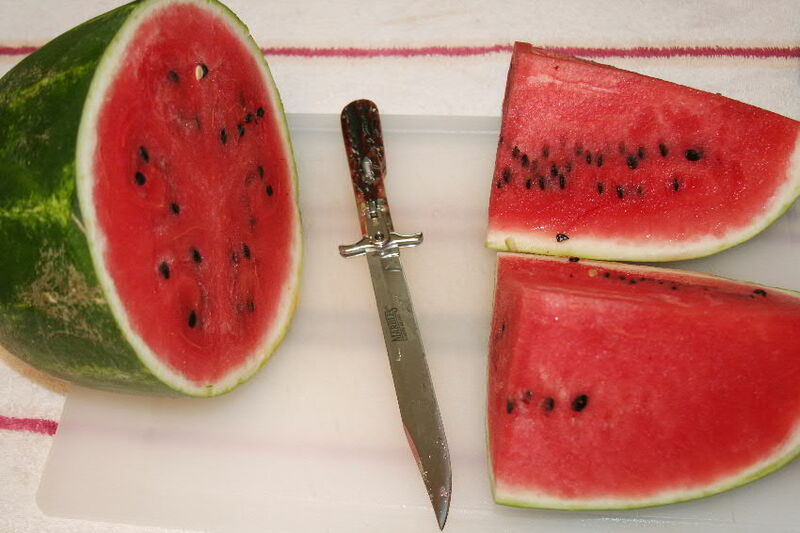 However, it you want to impress kith and kin at your next watermelon slicing, this knife will do the job very well. I will employ it in a more fitting setting when the occasion presents itself. « Making Muzzleloaders from Cartridge Gun Designs: Not as simple as one might think. I also have one of the Case knives. I have been trying to find info on it and after going through every page case has I can’t find anything. I have searched about a hundred pages of photos and still can’t find it. Yours was the first I have even seen on the knife. Any info you have would be appreciated. The knife that I have is a Marble’s and not a Case. 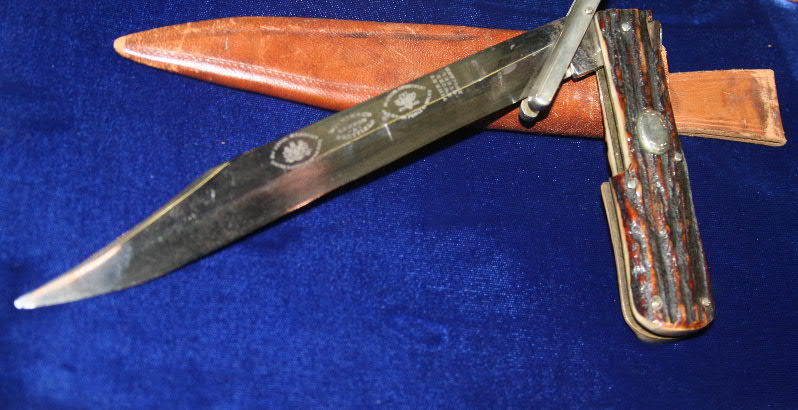 Case may have made a similar knife among the hundreds of patterns that they manufactured. If you can send me a photo, including a close up of any markings on the blade next to the grip, that would be helpful. Than link did not work for me. Can you try another way, like post low res. photos on Facebook, Twitter or Pinterest? Or, send as an attachment to me at http://www.hoveysmith.com. In looking back over this post, I see that I did photograph a Case knife of this type at the Blade Show. I assume that you knife looks like it. It was never a popular style and that makes it highly collectable. 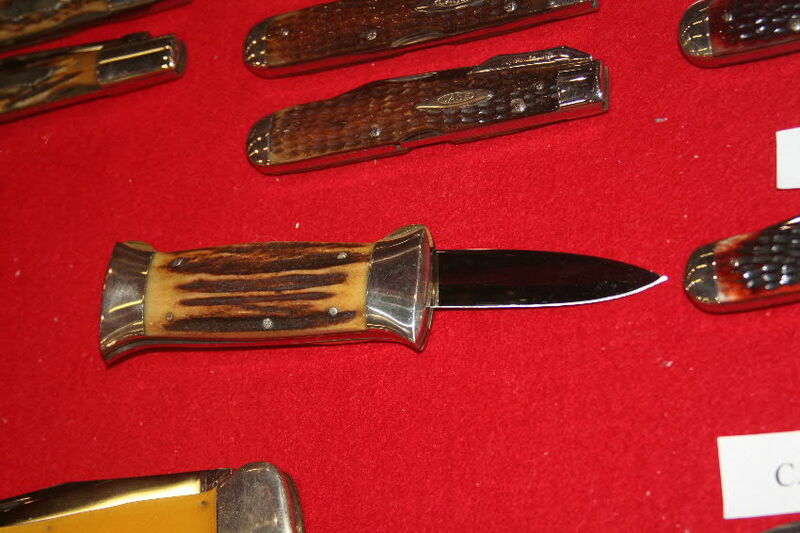 For more details you need to make connection with the Case Knife Collectors Association (may not be exact name). There you will find real experts on almost every piece of steel that Case ever pounded into a knife or even thought about.